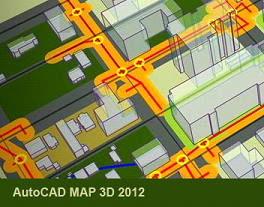 Our AutoCAD Map 2012 training dvd will show you how to effectively use this software in your daily tasks. Our video based instructor led training dvd for AutoCAD Map 3D 2012 will teach you to plan and manage model-based infrastructure and access CAD and GIS data. Lessons and demonstrations include beginner, intermediate and advanced concepts on surveys, topologies, coordinate systems, queries, source drawings and much more. With over 13 hours of instructor led training, our training for this mapping software will provide you the skills needed to work effectively with this robust program, so you can apply regional and discipline-specific standards to help improve data quality, support productivity, and better manage infrastructure assets. Beginning with an overview of the MAP 3D user interface, and ending with a review of Map Books, this training tutorial will help you work with spatial data more efficiently.